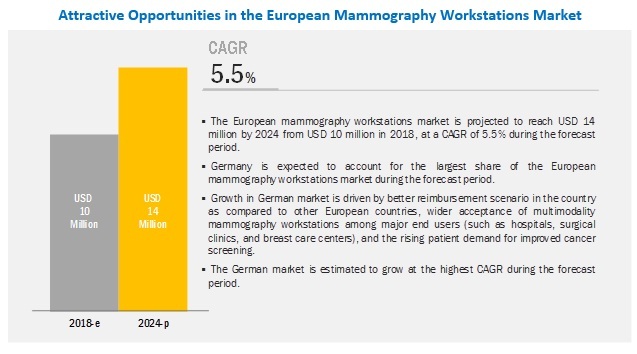 [113 Pages Report] The European mammography workstations market is estimated to grow at a CAGR of 5.5% to reach USD 14 million by 2024 from USD 10 million in 2018. Factors such as the rising burden of breast cancer, increasing market availability of multimodality diagnostic platforms, and the increasing patient awareness about the clinical benefits associated with the early diagnosis of breast conditions are driving the growth of the market. On the basis of modality, the European mammography workstations market is segmented into mammography (X-ray) workstations and multimodality mammography workstations. In 2018, the multimodality mammography workstations segment accounted for the larger share of the market. This can be attributed to the increasingly supportive government initiatives/regulations in Europe, increasing awareness about the diagnostic efficacy of contrast-enhanced digital mammography, growing market availability of integrated mammography solutions, techno-commercial advantages associated with multimodality mammography workstations, and the rising prevalence of breast cancer. On the basis of applications, the market is segmented into diagnostic screening, advanced imaging, and clinical review. The diagnostic screening segment accounted for the largest share of the market in 2018, and this trend is expected to continue during the forecast period. This can be attributed to the ongoing market transition from 2D to 3D clinical diagnostics; the market shift from single-modality workstations to multimodality diagnostic imaging; greater integration of key diagnostic imaging modalities with PACS, artificial intelligence (AI), and cloud-based platforms across mature countries; and the large end-user base for mammography in Europe coupled with their ongoing integration with imaging workstations across key countries. On the basis of end users, the European mammography workstations market is segmented into hospitals, surgical clinics, & diagnostic imaging centers; breast care centers; and researchers & academia. The hospitals, surgical clinics, & diagnostic imaging centers accounted for the largest share of the market in 2018. This can be attributed to the ongoing technological advancements in the field of diagnostic data visualization & analysis, rising number of breast screening programs and the implementation of comprehensive breast screening guidelines across European countries, growing awareness about the clinical benefits offered by multimodality workstations, and the growing trend of workflow automation among healthcare providers. This report covers the European mammography workstations market across Germany, the UK, France, Italy, Spain, and RoE. Germany accounted for the largest share of this market in 2018. The large share of Germany is primarily attributed to the better reimbursement scenario in the country as compared to other European countries, wider acceptance of multimodality mammography workstations among major end users (such as hospitals, surgical clinics, and breast care centers), and the rising patient demand for improved cancer screening. General Electric (US), Koninklijke Philips N.V. (Netherlands), Hologic Inc. (US), Siemens (Germany), and FUJIFILM Corporation (Japan) are the major players in the European mammography workstations market. Other prominent players in this market include Carestream Health (US), EIZO Corporation (Japan), Agfa-Gevaert Group (Belgium), Barco (Belgium), Konica Minolta, Inc. (Japan), Benetec Advanced Medical Systems (Belgium), PLANMED OY (Finland), Sectra AB (Sweden), Aycan Medical Systems, LLC. (US), and Esaote SPA (Italy). Hologic has its prime focus on female health along with its extensive research and development. Having a strong sales and distribution network in the European region, the company holds a strong market position for women’s health. The company also formed a strategic partnership with Philips, which allowed both companies to expand their product portfolios by providing integrated suites of diagnostic imaging modalities, advanced informatics, and services. Such strategies have enhanced Hologic’s market presence, and the company is expected to be one of the top players in the medical imaging workstations market during the forecast period. FUJIFILM is one of the leading players in the European mammography workstations market. The company provides workstations for computed radiography, digital radiography, and digital mammography systems. The company has a strong foothold in Europe. FUJIFILM launched a number of important products in the market in the past three years. The company also focuses on product showcases to increase awareness about its products. For instance, in 2018, the company showcased its advanced image and information systems at the American College of Cardiology’s (ACC) 67th Annual Scientific Session and Expo in Europe. FUJIFILM’S strong brand image and vast geographical coverage are supporting its growth in the market during the forecast period. In February 2019, Fujifilm (Japan) launched ASPIRE Bellus II. In January 2018, Agfa-Gevaert NV (Belgium) signed a contract with the West Suffolk NHS Foundation Trust (UK) in order to implement enterprise imaging for radiology platform. In May 2017, Siemens AG (Germany) and Fraunhofer MEVIS (Germany) entered into a partnership for developing artificial intelligence software systems to facilitate diagnosis and therapy decisions in order to support physicians to define the best possible treatment approach. What are the strategies adopted by the top market players to penetrate the European market? Who are the major players offering multimodality workstations across major European countries? What revenue impact will multimodality workstations have in the market during the forecast period? Which type of mammography workstations are used in every end-user setup, and why? What is the adoption pattern for multimodality and standalone mammography workstations across the European market? 11.2 Aycan Medical Systems, LLC. This study involved four major activities in estimating the current size of the European mammography workstations market. Exhaustive secondary research was carried out to collect information on the market, its peer markets, and the parent market. The next step was to validate these findings, assumptions, and sizing with industry experts across the value chain through primary research. Both top-down and bottom-up approaches were employed to estimate the complete market size. Thereafter, market breakdown and data triangulation processes were used to estimate the market size of segments and subsegments. 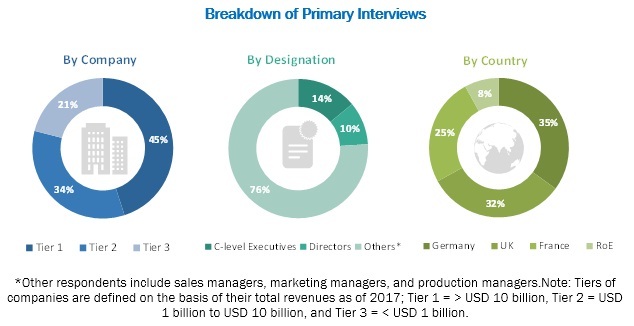 Secondary research was conducted to obtain key information about market classification and segmentation, identification of key industry trends, regional scenario, and key developments undertaken by major European market players. Secondary sources include Journal of Mammography, Journal of Digital Imaging, European Journal of Radiology, European Society of Breast Imaging (EUSOBI), European Reference Organisation for Quality Assured Breast Screening and Diagnostic Services (EUREF), annual reports, press releases, and investor presentations of companies, white papers, certified publications, as well as articles from recognized websites, databases, and directories. A detailed market estimation approach was followed to estimate and validate the size of the European mammography workstations market and other dependent submarkets. The above-mentioned data was consolidated and added to detailed inputs and analysis from MarketsandMarkets and presented in this report. After deriving the market value data from the market estimation process explained above, the total market value data was split into several segments. Data triangulation and market breakdown were undertaken to complete the overall market engineering process and arrive at the exact statistics for all segments, wherever applicable. The data was triangulated by studying various qualitative & quantitative variables as well as by analyzing country-based trends for both the demand-and supply-side macro indicators. In this report, the European mammography workstations market has been segmented based on modality, application, end user, and region.